In this guide we will list the best and cheapest option to get from Don Mueang Airport to Bangkok city centre using either the train to get to Hua Lamphong Station or the A4 airport bus to get to Khao San Road – the backpacker mecca of Bangkok. 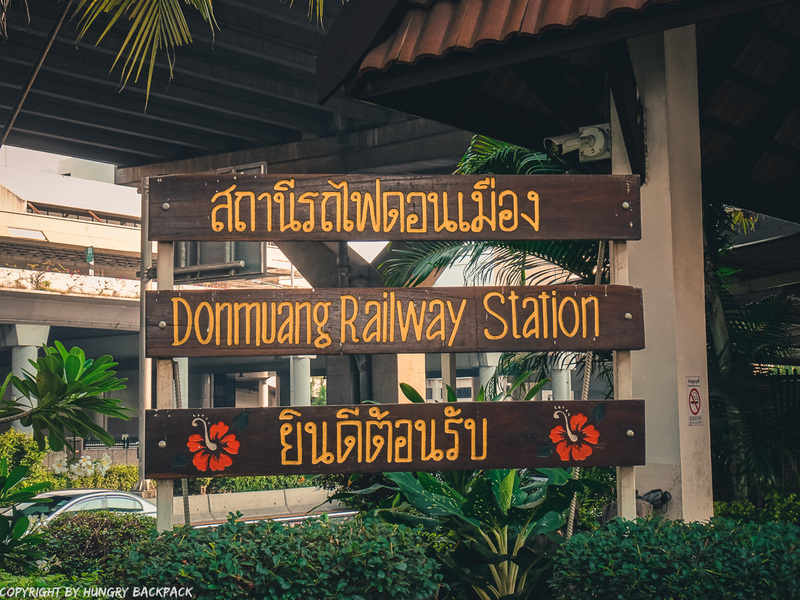 When travelling around South East Asia and having a flight booked to Bangkok with one of the low-cost carriers such as AirAsia & Co. it is very likely you’ll be landing at Don Mueang Airport (DMK) one of the oldest international airports and the largest low-cost carrier airport in the world! 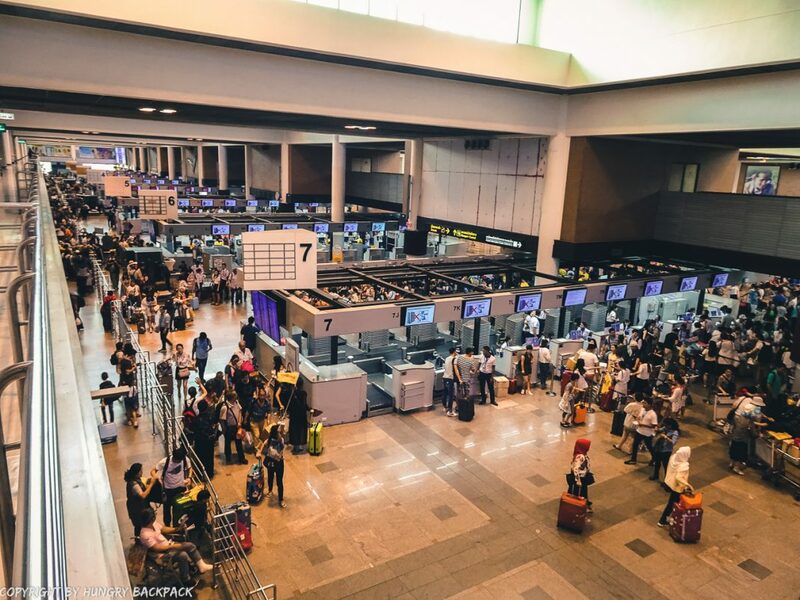 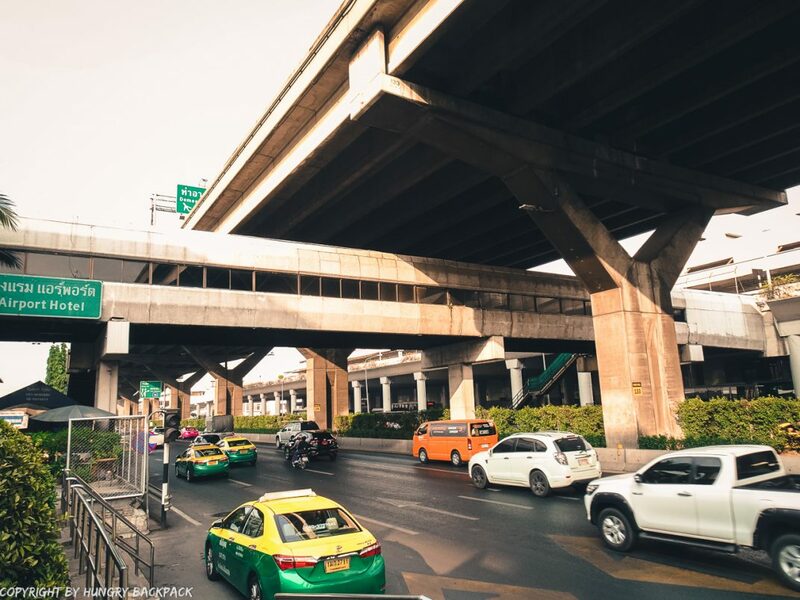 But enough with all the fun facts about Don Mueang chances are you don’t care as much about the airport as about the city you’ll be visiting and you’ll be in for a treat – Bangkok is definitely among our top 3 cities in Asia! 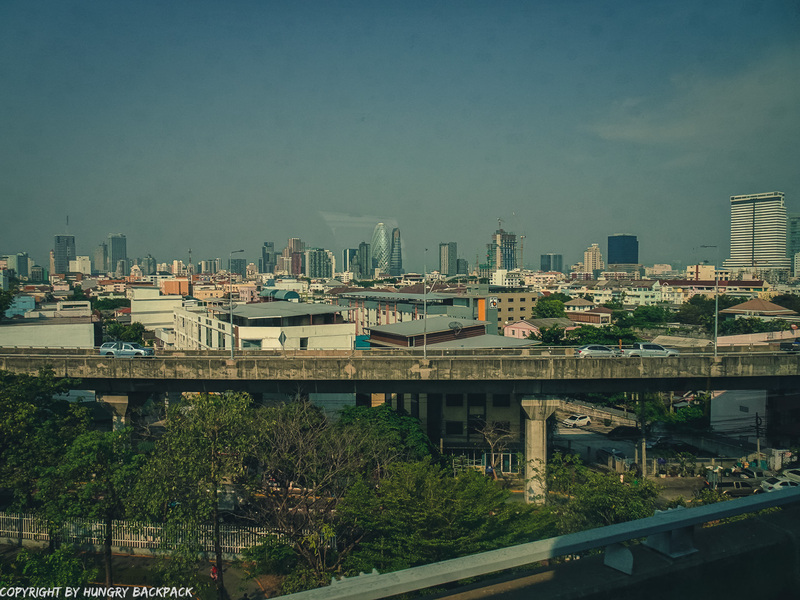 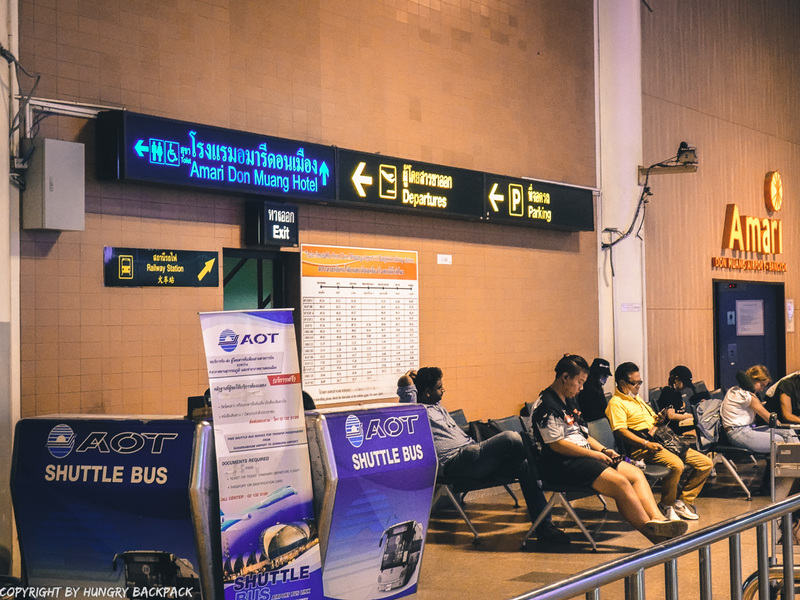 However, in order to get to Bangkok’s city centre and all the fun stuff there is to do in Bangkok you first need to figure out the best way to actually get from Don Mueang Airport to the city where all the action is happening. 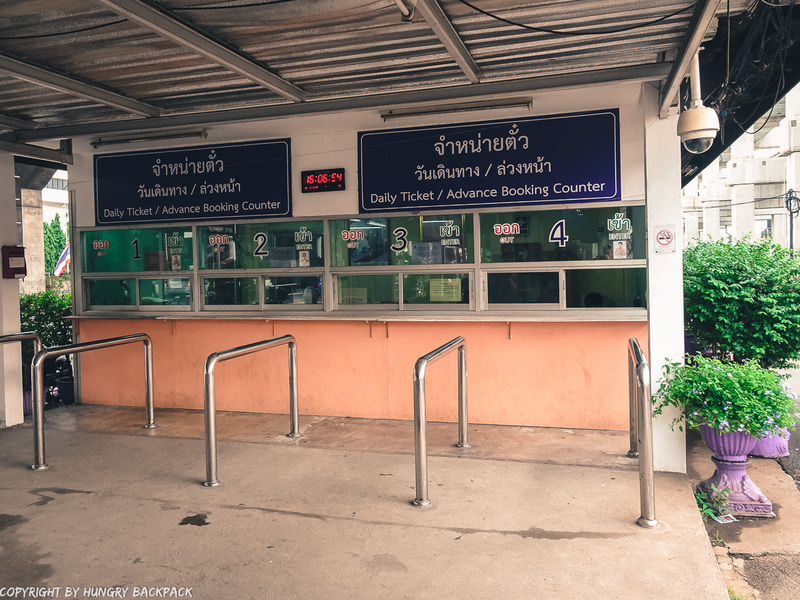 Taxi costs around 300THB – 400THB no matter if you take a local taxi or use Grab Taxi. 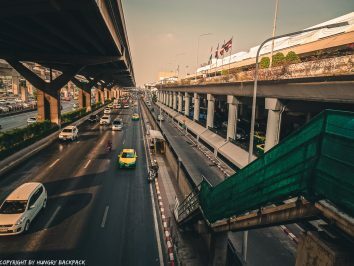 So, if this seems a bit too steep then keep on reading as we’ve put together a detailed guide on how to get to Bangkok from Don Mueang Airport by local transport showing you the best options to get to Bangkok’s famous Khao San Road using the A4 airport bus as well as to Hua Lamphong Train Station hopping on a local commuter train from Don Mueang Railway station just across the airport building. 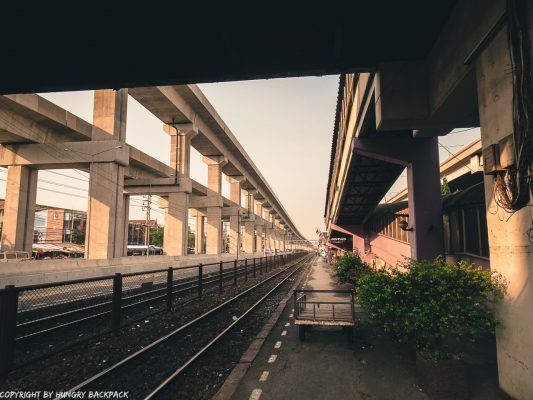 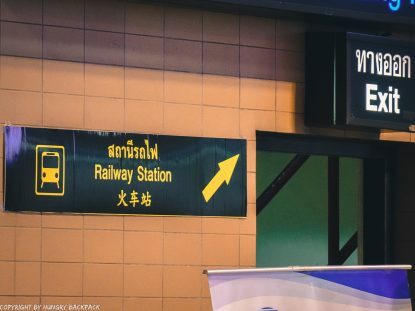 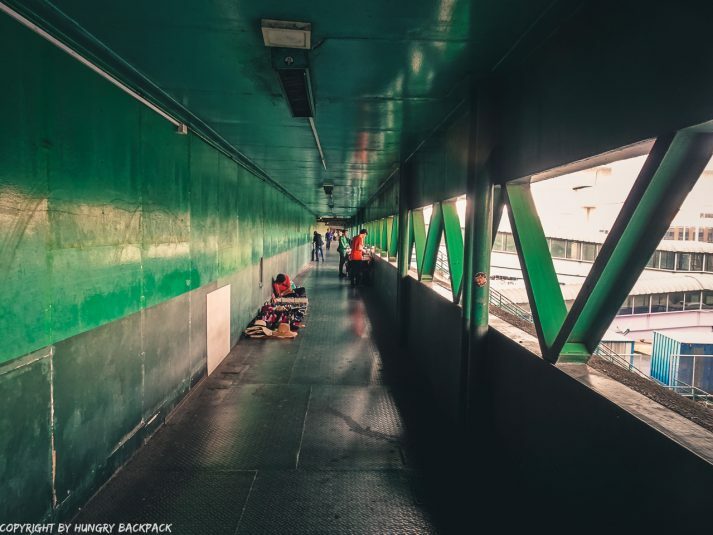 Note: They are currently also building a MRT station which will soon offer an additional budget option to get you from the airport to the city. 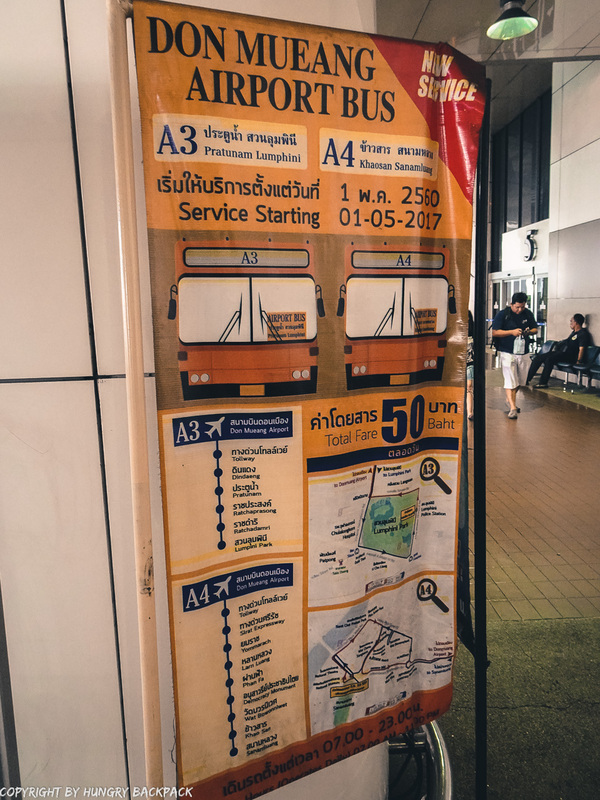 If you are on a budget the cheapest way to get from Don Mueang Airport to the popular Khao San neighbourhood is to take the A4 airport bus. 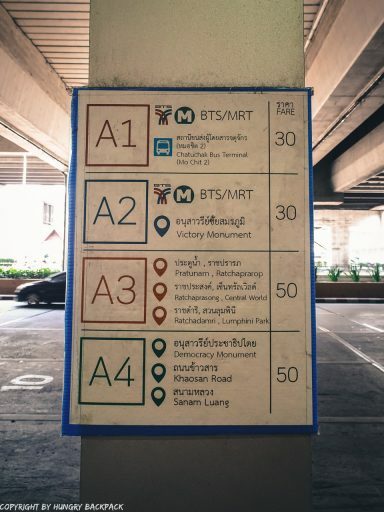 It only costs 50 THB/person and you can catch the A4 Bus right outside the arrival hall of Terminal 1. Simply head to Floor 1 (Arrivals) and leave through Gate 6. 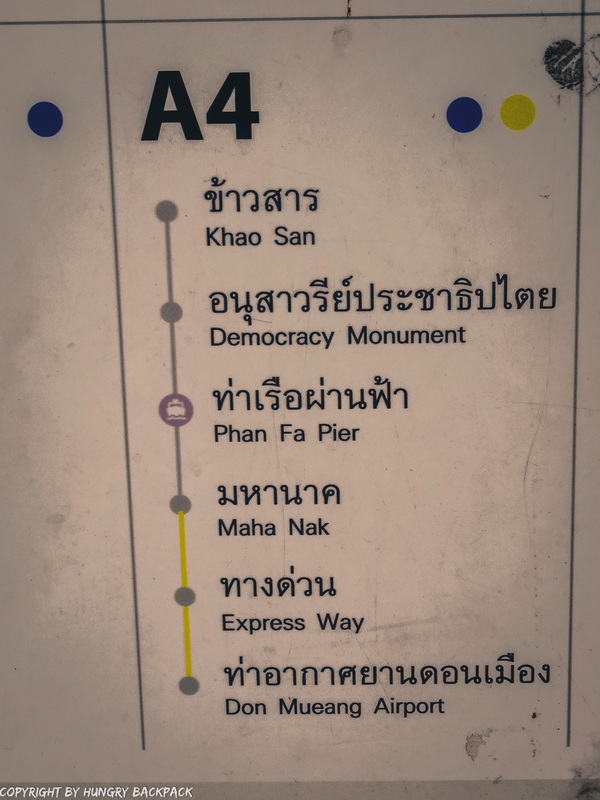 The A4 Airport Bus to Khao San Rd. 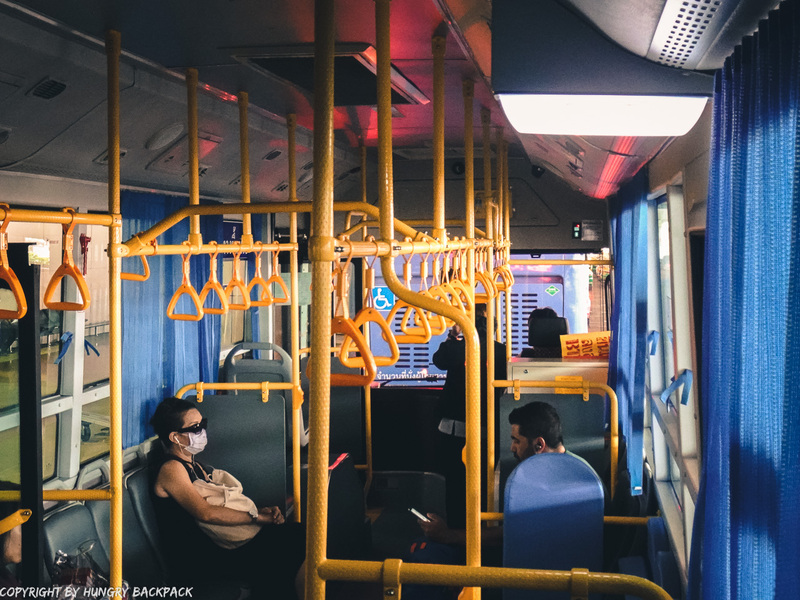 runs every half an hour and the journey takes around 45 – 60 minutes, depending on traffic, with hardly any stops in between. 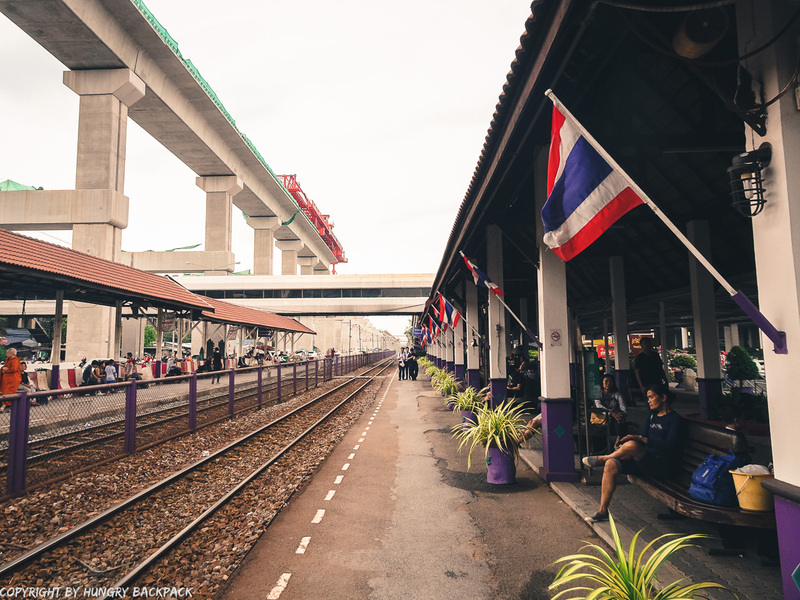 Think of it as your super cheap express ticket to the heart of Bangkok’s backpacker scene. Where to stay in Khao San area? 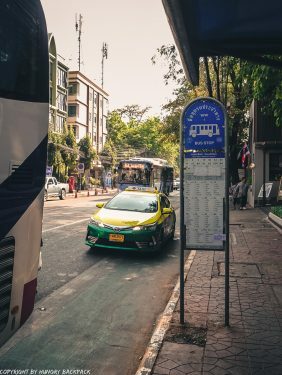 Should you plan on staying in the Khao San area we can highly recommend “THE GREEN HOUSE HOTEL*” – also known from the Netflix series “Jack Whitehall: Travels with My Father” (S1E1). They have dorm rooms as well as private double and twin rooms with en-suite bathrooms at a very affordable rate. How to get back from Khao San Road to Don Mueang Airport with the A4 Airport Bus? There are several bus stops in the Khao San Road neighborhood from where you can simply hop on an A4 Airport Bus taking you all the way back to Don Mueang Airport in 40 – 60 minutes. Busses run every half an hour, stop only a few times and the fare is 50 THB per Person. We took the bus stops right at the Phra Arthit Pier (the one you use to get off for Khao San Road if you’re using the boat) and it was a smooth ride back. Should you stay around Hua Lamphong Station, need to switch to the MRT or have already booked your onward train journey to Chiang Mai in the North or the islands in the south then you should definitely take the train from Don Mueang Airport which will be the easiest and cheapest way to get to Huan Lumphong Station. 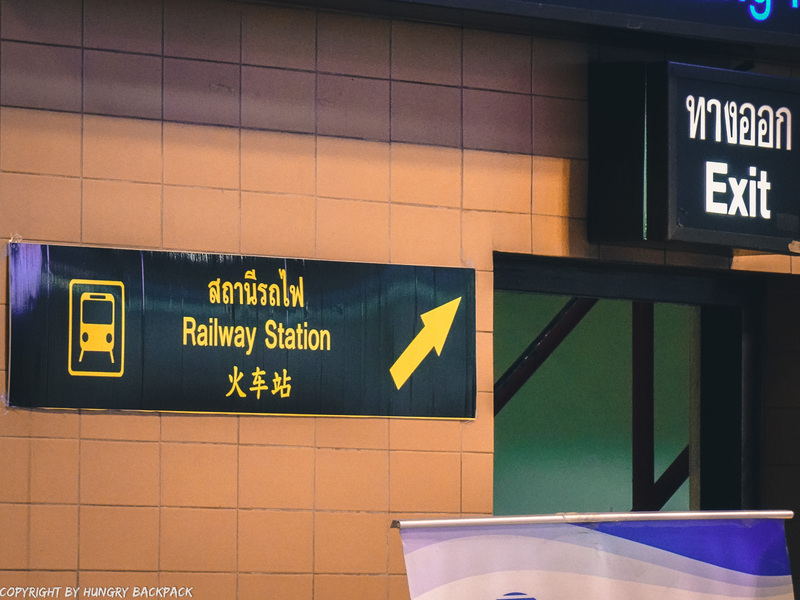 You can simply hop on one of the many commuter trains connecting Don Mueang Airport and Hua Lamphong station! 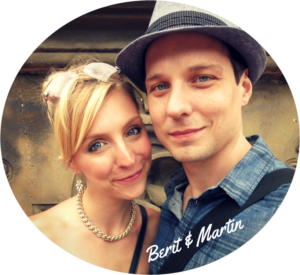 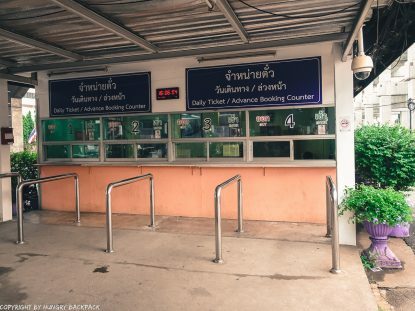 The train station is just a short walk from the Airport terminal and tickets only cost 20THB! 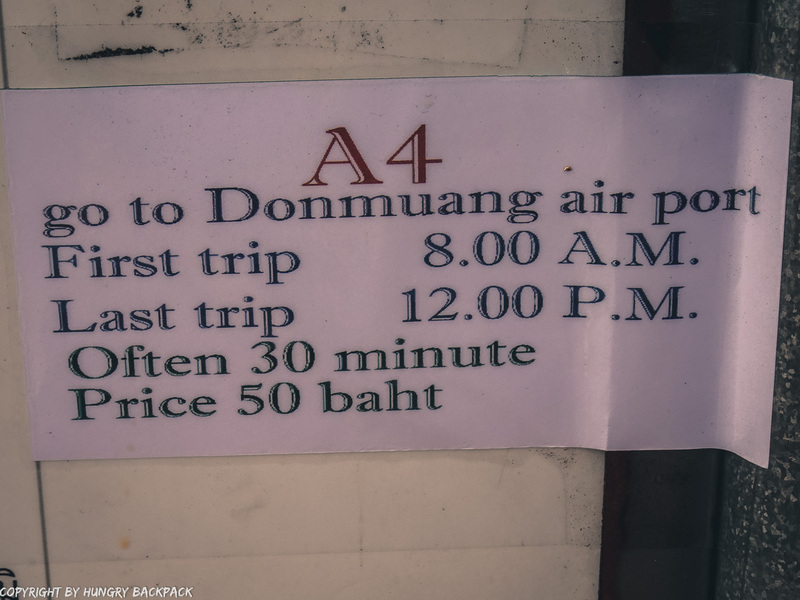 (less than 1 USD) – What a bargain! 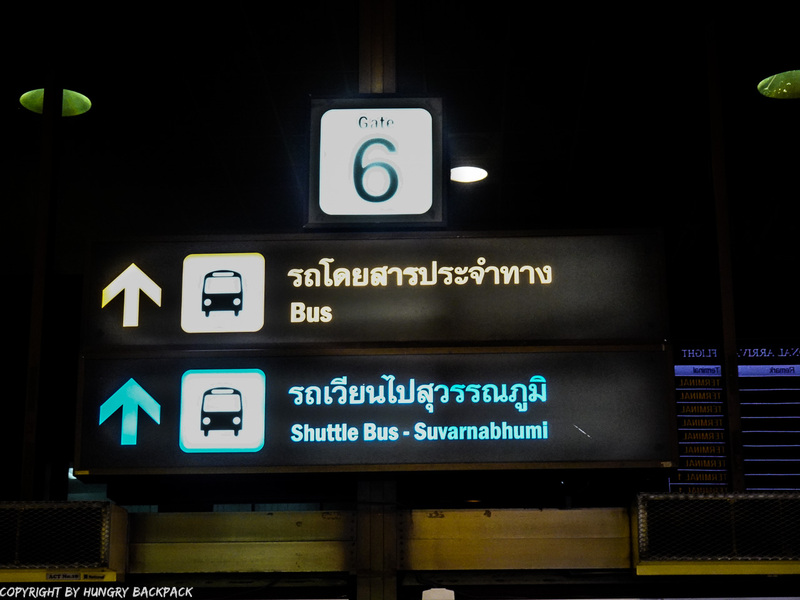 To get to the train station you simply have to cross the motorway between the Airport and the train station. Luckily there is a crosswalk which you can take to get there very easily right from the Arrival Hall at ground level of Terminal 1. 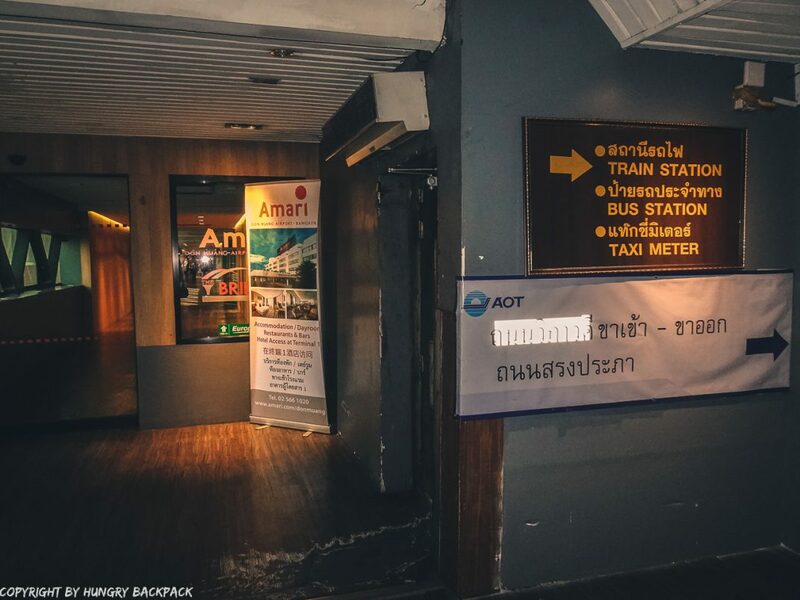 In the Arrival Hall, simply look out for the big orange sign of the Amari airport hotel and take the elevator or the stairs to level 1. Once you get off the elevator exit through the door on the right just before the hotel corridor begins. Cross the motorway via the crosswalk to get to the other side and voilá, the platform for the trains towards Bangkok will be the very first one. Note: You can take any train which stops here to get to Hua Lamphong Train station. 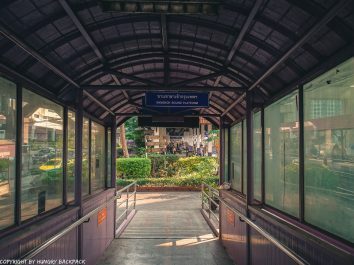 Once you arrive at Hua Lamphong Station you can also switch to the MRT – the closest metro station is just a few steps away. 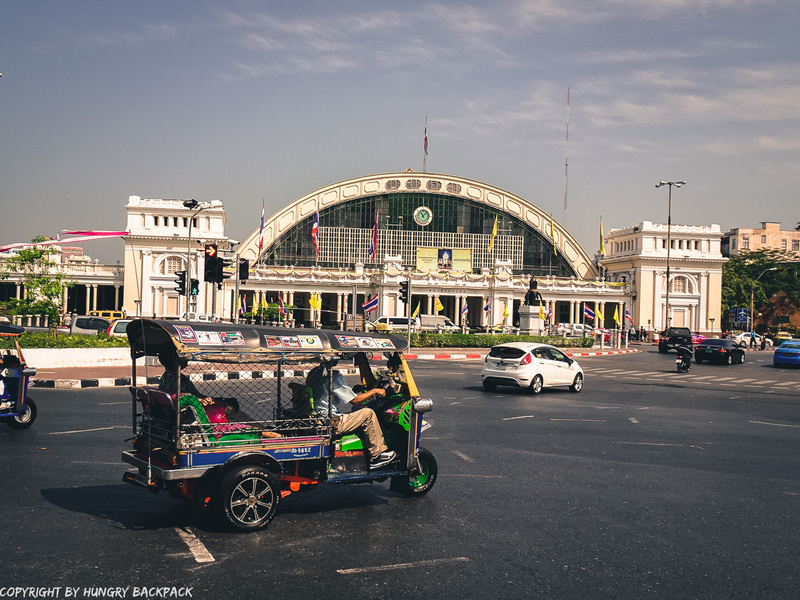 We hope this guide will help you to get to Bangkok’s city centre quickly and easily without spending too much of your holiday cash! 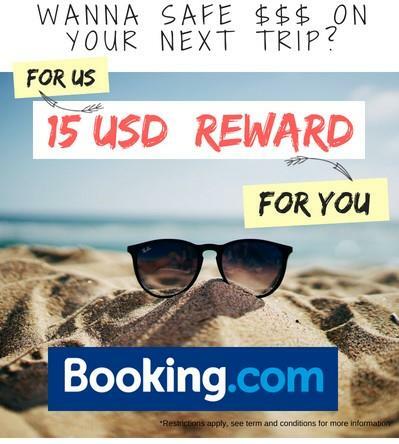 🙂 Let us know in the comments below if you need any further assistance. 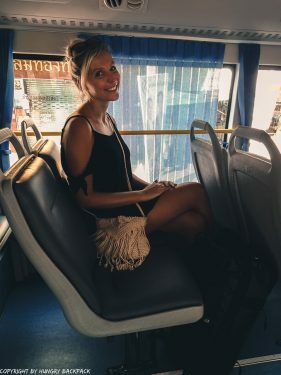 We stayed at the “THE GREEN HOUSE HOTEL*” – also known from the Netflix series “Jack Whitehall: Travels with My Father” (S1E1). 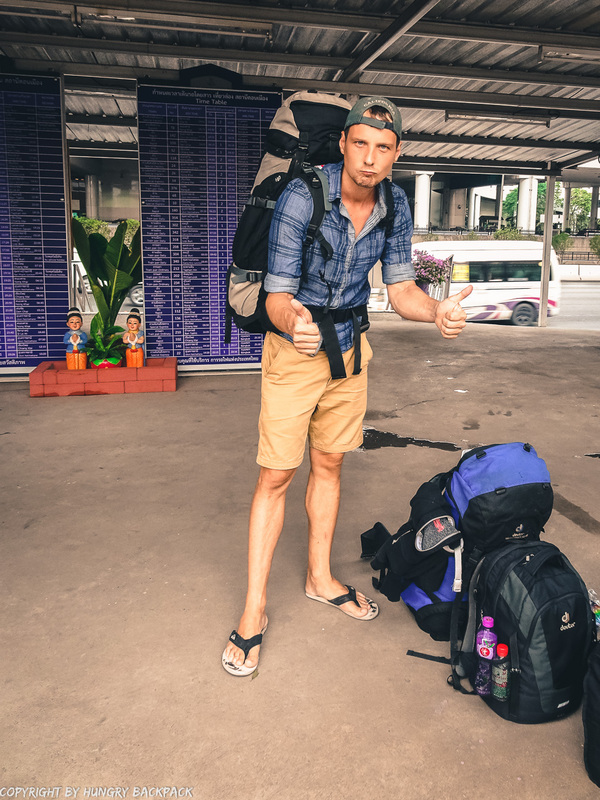 They have dorm rooms as well as private rooms with en-suite bathrooms at very affordable rates.